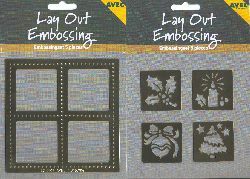 Five handy embossing templates ideal for creating beautiful cards. Use the layout template on its own, for creating beautifully embossed edges and filling in spaces in a variety of creative ways. Emboss the lovely patterns on cards, Color them with chalks or an inkpad or combine them with the accompanying layout template.